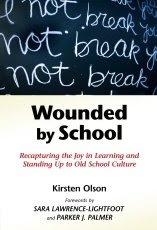 Kirsten Olson is a writer, educational consultant, and national-level Courage To Teach facilitator, and principal of Old Sow Consulting. She has been a consultant to the Bill and Melinda Gates Foundation, the Kennedy School at Harvard University, and many large public school systems and charter schools. For more information please visit Kirsten's website. "This wonderful and probing book is filled with . . . powerful, poignant, passionate stories -- stories that are at once fragile and strong, painful and enduring. They make us mourn the losses of laughter and opportunity in schools, weep at the lingering sadness and sorrow in schools, laugh at the absurdities, and grin at the moments of mischief and inspiration." "Kirsten Olson has written a book that is at once intellectually engaging and replete with usable resources and proposals for action . . . May this splendid book be read, discussed, taken to heart, and put into action." "A brilliant, original, and important book. Wounded by School makes an eloquent and moving case for the radical re-invention of our schools." As a single mom who LOVES learning and always has, I was shocked when my children began learning things earlier than I learned them. They are being made to work harder, much earlier. Parents have to fight school systems when the schools tell a parent that their child has a learning disorder, dyslexia, or ADHD, when in reality, the school is not challenging or entertaining the child. I appreciate this book for these reasons. School should not be a "prison sentence" that children are forced to endure until they turn 18. It should be embraced, every day anew, to learn something new. I myself have a child with ADHD who has to constantly come up with creative ways to teach my daughter at home, effectively. I've had to fight the system to get them to work with her more. I hate that I have had to do this, but you do what you have to do for your children. Every parent needs to read this book, and call for change in America's school systems. Very good post, and based on your evaluation, sounds like a very good book as well. We had family members try to get us to homeschool our 3 kids. We didn't, although one of them had so much problems for a couple of years from mean kids she asked us to homeschool her. We took the work-it-out approach which we think (hope) will prove to be ok. But, even though our kids went to public school, Cheryl and I were very hands-on with them. We read their books and homework assignments, helped them, went to the schools frequently, got to know the teachers, etc. I also taught the kids how to critically evaluate what they were being taught so they wouldn't just swallow someone else's opinon without first chewing on it themselves. So many kids go through school without learning how to think, process thoughts, and formulate their own opinions and viewpoints. In some ways, modern education is like a restaurant - the food is delivered and you just have to eat it. What is the quality of the food? How sanity is the kitchen? These kinds of questions could be asked about some of the educational process and information as well, but isn't. You are right to be concerned. Because you are, I think your kids will do fine. I wish you could talk to Cheryl (my wife) about this b/c she handled school very well. But, she doesn't blog! Note: I think I linked here from Shanda's site. You have a very good blog.